Bushwacking a New Trail with WTA. 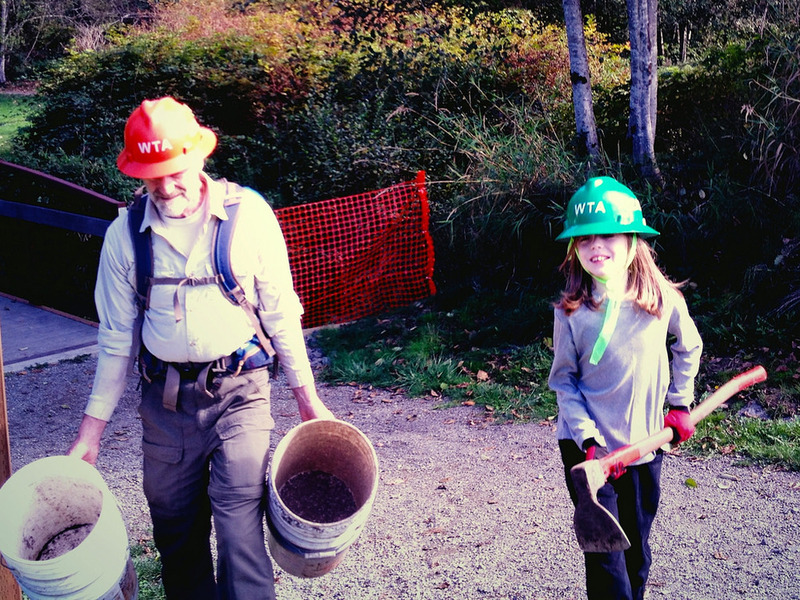 The Homeschool Stewardship Squad loves working with the Washington Trails Association and this event was no exception! For the first time ever, we had the chance to bushwack a trail completely from scratch. It was an excellent opportunity to show kids just how much work it is to create trails. Beaver Lake Preserve in Sammamish was a new location as well. The forest is charming and will be much more accessible with the new trail addition. The children appreciated the opportunity to saw branches and even logs in the way of the flagged route. The rich organic duff layer was scrapped away to reveal the stable mineral soil, which is a more suitable trail tread. The largest log required a big group effort to both turn and then push off the trail- with our legs! From a seated position, everyone's back was safe, not to mention toes. Needless to say, it was very fun! Also, remember that you can now create your own free (membership/donation appreciated!) account on WTA's website with your name, where you can save hike, log your work parties and more. "This trail is a little piece of the backcountry close to Seattle and is open to hikers, mountain bikers and equestrians. Winding through 1,200 acres above Issaquah and Lake Sammamish, Grand Ridge Park is the result of a unique agreement between Port Blakely, which developed the Issaquah Highlands and King County. For every one acre of developed land, Port Blakely agreed to set aside four acres of park land." The views are long and the forest is quite nice with few invasive species that we saw. Squad split up into groups to tackle different trail-work tasks. The work included digging drainage ditches, leveling gravel, removing organic material from the trail and replacing it with mineral soil which is more stable. The stable soil was dug from a borrow pit as deep as the children! They loved climbing down into it to fill buckets and handing them out to be dumped down the trail. We also dug a few hardy sword ferns and transplanted them alongside the trail to fill bare spots. One keen-eyed volunteer spotted a Northwestern salamander (pic below), which fortunately was picked up with gloves, as the oil on our skin interferes with their essential mucus layer. A fun find. Eric received his 5-party hardhat with his name on it, congrats to him and all of the other volunteers stock-piling their events (25 party vest and 50 work party saw!). 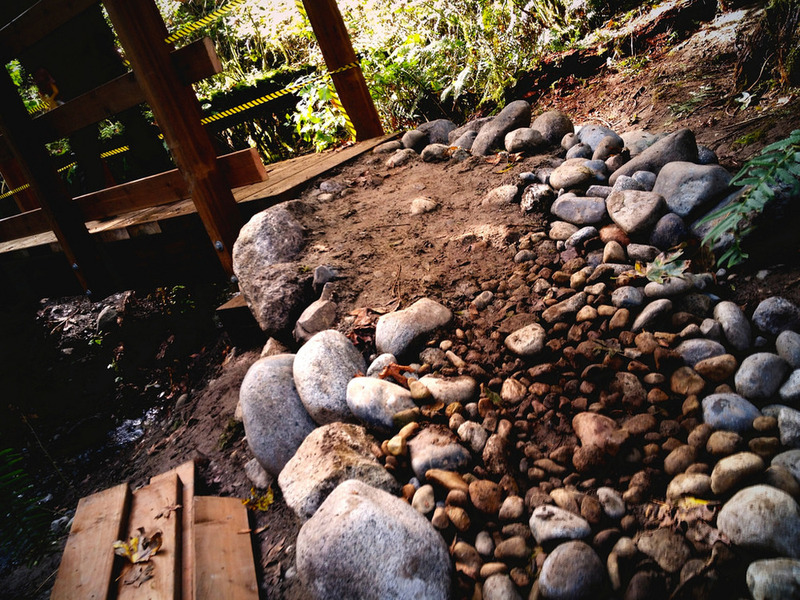 Water & Gravel Work for Dry Trails on Cougar Mt. With WTA. The Homeschool Stewardship Squad is four years old! It gives me great joy to see all the faces, families and muddy boots working together to care for our local wilderness. As with our first event, the Washington Trails Association (in partnership with King County Parks) hosted us on Cougar Mountain. We appreciate our many non-profit and municipal partners who have taught us restoration techniques, thoughtfully designed successful work and graciously led us to special places- thank you! From the history-rich Red Town Trailhead (go see the mine shafts!) we worked to improved trail drainage amongst the rich mossy maple towers and burbling creek. By now many of the kids are experienced at bucket brigades and the new ones joined right in to haul gravel apx. one hundred yards down various trails to fill in mud puddles. Another team dug heavy gravel from the pile, loading it into both buckets and wheel barrows for the long journey to the work sites, one of which was a serious piece of hydrologic engineering the kids greatly enjoyed- creek splashing, ditch digging, gravel dumping! We even got to see a miniature iceberg that had formed in a creek eddy. It was a saucer-sized eight inch little crystal dome marvelously pirouetting in its endless whirlpool. Balancing sensitive human access and natural preservation is crucial work, for our species and every other. Many walkers, hikers and trail-runners thanked us for our stewardship. Here's to many more years of caring for our beautiful environment. Cougar Mountain Autumn Trail Work With WTA. Looks like a pale..... Amanita? Now that Squad has been at it for four years, it is exciting when we have the chance to revisit a past stewardship site, tend our previous work or tackle a new task- and we got to do all three! The great folks at King County Parks and WTA led our project, consisting of opening deer-proof cages to weed and re-mulch the native Sitka spruce, grand fir, cedar and Douglas fir trees. In fact….. we just may have planted these trees over two years ago! This is Squad's third+ time at the fairly-new Sky Country Trailhead at Cougar Mt. which was opened with funds from a parks levy approved by voters. The day was a lovely sunny one amidst a week finally bringing the wet fall weather. We saw many mushrooms and also dog's vomit slime mold (see below)! Autumn colors were out and the moss was thick and pretty above the mysterious old buildings- remnants of past missile testing. Another place to read more about the history of the park is in WTA's article on historic Cougar Mt. hikes from this trailhead. It is always inspiring to work with Pete, who has done over 1,500 work parties! He showed the kids is 50+ WTA saw. The kids, parents and (two!) grandparents worked so hard we finished early. We'll be back in November. Salmon rush-hour on the Green River. The pink salmon were thick & busy, splashing in the sunlight over the shallow gravel beds in the Green River Natural Area at O'Grady- it was the most amazing display of spawning ferocity! We stayed out of the areas most densely populated and watched from the edge. They are also called humpies because the males have an arched dorsal ridge that rises out of the water. Also along the water was noxious but lovely Impatiens capensis / spotted jewelweed. Prior to exploring the river and viewing the salmon, we worked with King County Parks to maintain the trail system in the forest by removing rocks larger than a golf ball size. Many horses ride the miles of trails, as well as hikers and trail-runners. The salmon reach far into the forest up the streams, so we are looking forward to returning and helping to restore the forest further. Our little cedars from last spring are looking spry and lush despite the drought! First of the Summer Swims, on the Green River. The day was warm, the hike was long, the work was short and the river sparkled. Squad enjoyed many creature sightings in the O'Grady Natural Area including salmon fry/parr darting through the noxious reed canary grass, fresh elk scratchings (removing their antler velvet), a plethora of caddis fly larvae, stoneflies (see last pic), jumbo(!) banana slugs and many Oregon spotted millipedes- not to mention a bonanza of gorgeous salmonberries / Rubus spectabilis and luxuriant stinging nettles / Urtica dioica, which make for a painful picking affair, though the kids hardly minded. After rambling and eating, we reached our work site where a new section of trail is being completed. Our task was to remove rocks larger than a golf ball and chuck them into the woods! Quite fun. After which we cooled off in the Green River (AKA the Duwamish) which was low from the lack of snowmelt this year. King County manages the property as part of the 922-acre Green River Natural Area. Squad has worked at this lovely site on several occasions now, we look forward to further events and maybe even the chance to be invited to a PAWS release! Marah oreganus / coastal manroot is a native vine in the Cucurbitaceae, related to pumpkins, cukes, gourdes, etc. Stonefly molt (one of many in their lifecycle) indicating good water quality. Here is an interesting article from King County on stream health indicators. The Mighty River Wound its Way Below the Forest in the O'Grady Natural Area. The Green River is an impressive sight, first your heartbeat quickens and then your breath slows as your body settle into its tiny position amongst the wide splendor. This was our second time working with WTA in the O'Grady Natural Area outside Enumclaw and was just as gorgeous as the first. King County now maintains the former farm and has connected-up the trail system, which receives use from equestrians, hikers, ramblers and trail runners. It stays quiet down by the river because the trailhead is > 1mi (uphill) from it. We planted little cedar plugs on a quite steep hillside. Many kids got stung by fresh juicy nettles and they boasted of who had the most. We also improved a trail section by reducing the uphill grade to prevent erosion and conversely, graded the downhill side to allow for drainage. The friendly side river channel was very fun to play in (reportedly still a good depth in the summertime). In the fall, the spawning salmon are close-up and plentiful under the bridges. We'll be back! Fawn bones. Likely killed by a cougar. Farm country on the way to the park. With their parent's permission, the children tried the taste of Polypodium glycyrrhiza / licorice fern that grows epiphytically, primarily on big leaf maples. Actual licorice flavour comes from Glycyrrhiza glabra and is in the legume family. Squak Lodge Trails: A New Park! Squad greeted 2015 in a crystal-dripped moss palace. Veiled in mist, we trucked up Squak Mountain to hike into a new trail being constructed in King County's new nature park, Squak Lodge Trails. We first worked here back in September with the WA Trails Asscn, the site has an interesting former use. The kids took up the challenge of grading slopes and shoveling cut & fill, with the usual hardy sword ferns replanted along the sides. A beautiful afternoon. Rock Work on a Bridge Approach, Bear Claws and Ferns Ferns Ferns. 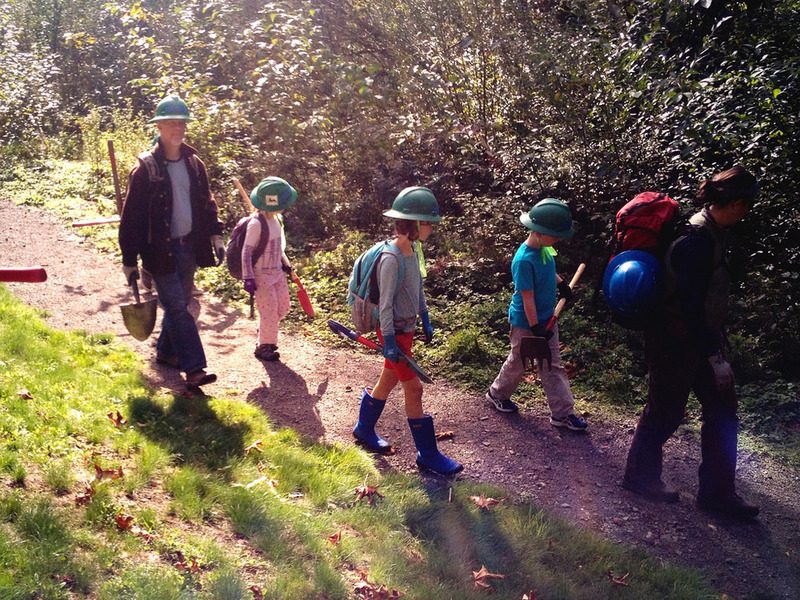 The children worked hard hauling rocks in formation for a bridge approach on a trail at Evans Creek Preserve with the WA Trails Association. It is enjoyable to return to the site of our original Stewardship Squad event as we approach the Homeschool Stewardship Squad's third year in service! The number of ferns that we have transplanted measure in the hundreds by now. 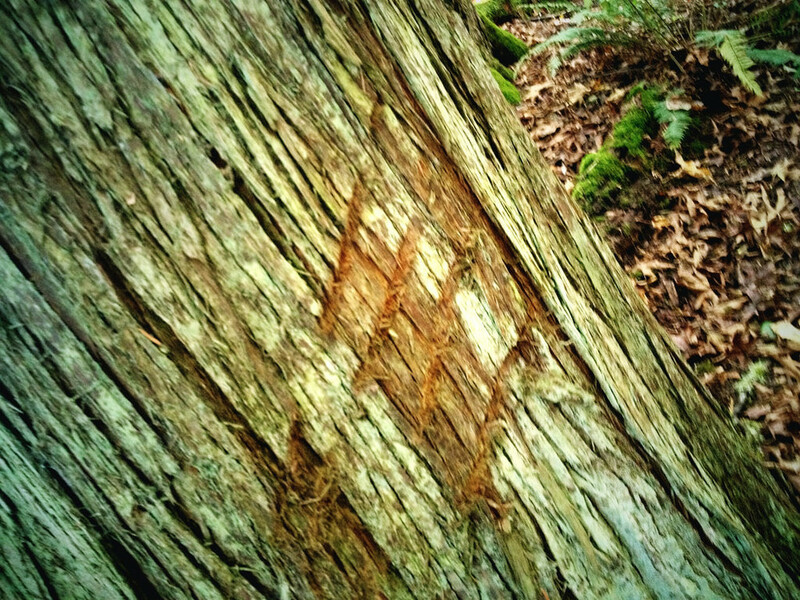 Krista, our long-time WTA crew leader, aroused the children's rapt attention when she pointed to a tree showing the scratches of a bear's claw, which to everyone's relief were not fresh. 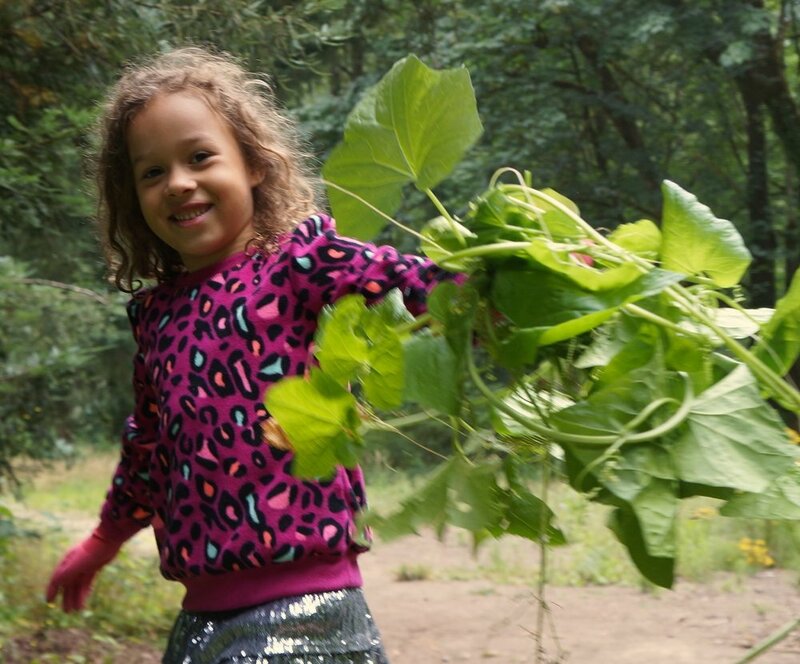 The children's sense of pride and ownership of the wilderness is evident when their forest play includes racing along trails, climbing trees and also commenting on areas in need of stewardship. Witnessing their sense of responsibility blossom alongside a carefree, satiating pleasure in nature is a lovely thing. New parkland on Squak Mtn. Creating & destroying a trail. Plus hardhat watering! King County acquired an interesting piece of property on Squak Mountain recently. The 226 acres are adjacent to Squak Mountain State Park and Cougar Mountain Regional Wildland Park (King County Parks) is being converted from a privately held trails and RV campground- it even features a lodge, which will be interesting to follow the development of. The terrific Trust for Public Land is temporarily purchasing the property to halt the logging planned, so that the County can arranged the funds to purchase it. Stewardship Squad transplanted native sword ferns / Polystichum munitum alongside new trails created by the Washington Trails Association and in the middle of old trails being decommissioned due to poor design (drainage, grade, etc.). It was a lovely end of summer day, just after a heavy downpour, so the plants and soil were hydrated enough to transplant- a bit risky until fall rain is steady. We helped them along by filling our hardhats with water, hauling them up the hill and watering them in. Great fun! Fern planting with the WA Trails Association at Evans Creek Preserve. These kids worked hard on an 80 degree day in May! They hiked in a half mile through a meadow and hauled great big sword ferns to transplant alongside a new trail. It was very satisfying to return to the first location that Stewardship Squad ever worked on with our old pal Krista Dooley at the WA Trails Association. At just 2yo, Evans Creek Preserve is a unique new public park hosting a charming network of trails criss-crossing a large historic property of wetlands, forest and meadow, gifted to the City of Sammamish. We reviewed what stinging nettles / Urtica dioica look like and wondered about all the fluff floating by. I knew it was too early for cottonwood and at the end I found the source- a willow species. My Salix ID isn't stellar, indeed a tricky genus with 50 sp in the PNW.....my best guess is Pacific willow / Salix lucida ssp. lasiandra. Coal Creek Trail with WTA. Destroying a trail! This was an exciting work party with the Washington Trails Association because we ruined a trail the first time! A portion of the Coal Creek Trail on Couger Mountain is often soggy, so this section was re-routed. We helped to transplant sword ferns / Polystichum munitum directly into the old trail so as to fill it back in. We had to leave a small path though, as the new section wasn't completely open and indeed trail-runners bobbed and weaved through the kids and the ferns as we worked. This was our first quite cold event for autumn 2013! A few headed out early and some had to warm their toes in their packs. Notable also were the very exciting truck rides up to the work site and brownies shared by another friendly WTA veteran volunteer! Stewardship Squad is building steam, working out on the Evans Creek Preserve trail again with the Washington Trails Association. The children were very inspired to meet the legendary volunteer Pete who has over 1,000 work parties under his belt. There was much talk of working to earn their five-work-party hard hats with their name on it.